The library administrators at the Cushing Academy, a fancy Boston prep school, has decided that books - physical, paper books - are just taking up too much space. So, they've gotten rid of the books in the library. Instead, they've gone digital, and decided to just put out some laptops and about 18 ebook readers. This year, after having amassed a collection of more than 20,000 books, officials at the pristine campus about 90 minutes west of Boston have decided the 144-year-old school no longer needs a traditional library. The academy’s administrators have decided to discard all their books and have given away half of what stocked their sprawling stacks - the classics, novels, poetry, biographies, tomes on every subject from the humanities to the sciences. The future, they believe, is digital. Instead of a library, the academy is spending nearly $500,000 to create a “learning center,’’ though that is only one of the names in contention for the new space. In place of the stacks, they are spending $42,000 on three large flat-screen TVs that will project data from the Internet and $20,000 on special laptop-friendly study carrels. 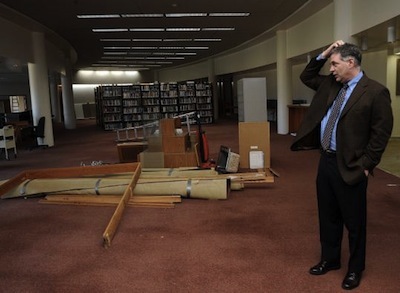 Where the reference desk was, they are building a $50,000 coffee shop that will include a $12,000 cappuccino machine. Unfortunately, the authorities didn't do anything to actually provide a digital substitute. For example, in his 2007 novel Rainbows End, Vernor Vinge discusses the replacement of libraries at great length. You start by tearing the books into tiny machine-readable bits with a Navicloud custom debinder. "Apparently, the Libreareome Project is someone's idea for photographing and then digitizing the Library. But -" suddenly he was remembering things from his last years at Stanford "- didn't Google already do that?" "That's true... [But] past digitizations have not been as global or as unified as this one will be. And Huertas has lawyers and software that will allow him to render microroyalty payments across all the old copyright regimes - without any new permissions." However, if you look at usage patterns at the Cushing Academy library, it appears that books won't be missed anyway. Tia Alliy, a 16-year-old junior, said she visits the library nearly every day, but only once looked for a book in the stacks. She’s not alone. School officials said when they checked library records one day last spring only 48 books had been checked out, and 30 of those were children’s books.